Come 1974 and the 911 got the 2.7 litre engine. At the same time, to satisfy the requirements of the American market, it got the new thicker impact bumpers and was designated the G Model. Depending on the version, the power goes from 150 to 210hp. This Carrera, the most sporting variant, has the 911/83 engine with the Bosch MFI mechanical fuel injection from the 1973 Carrera RS. 1633 coupes were built, which makes it a low production model in Porsche terms. In 1976 a final series of about 113 cars ending in chassis 9116609123 would be built for the German home market with a galvanized body. Some historians call this mini series a Sondermodell (German for a special model). 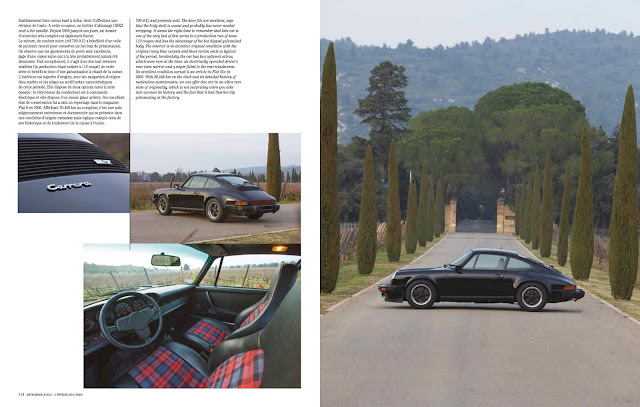 This makes it a certainly a collector's car and makes it possible to own an original 911 without restoring the bodywork. Its original Fahrzeugbrief shows that it was bought new in July 1976 by Hans Karmann. Two more German owners followed, Gerhard Gottwick in October 1976 and Wolfgang Utsch in January 1982. In September 1983 Daniel Brouillon bought the car and imported it to France. Four more French owners were to follow (La Galle, Cazaux, Mootgat) and finally Labat acquired the car in June 2005. 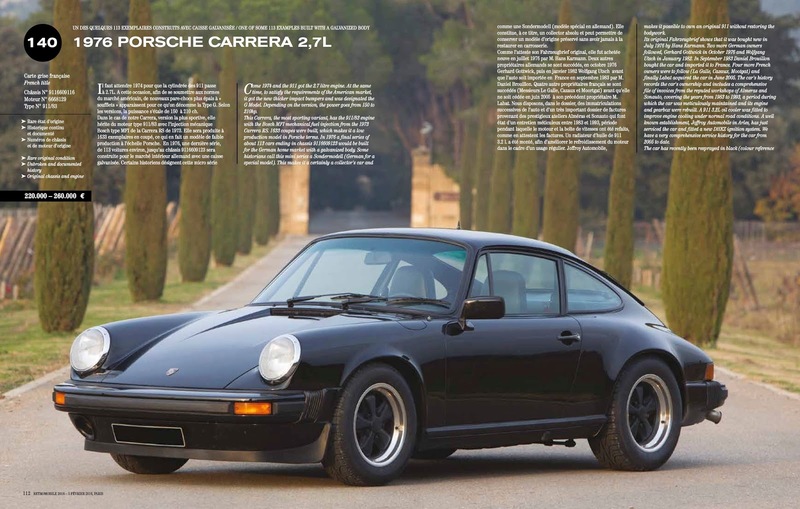 The car's history records the car's ownership and includes a comprehensive file of invoices from the reputed workshops of Almeras and Sonauto, covering the years from 1983 to 1993, a period during which the car was meticulously maintained and its engine and gearbox were rebuilt. 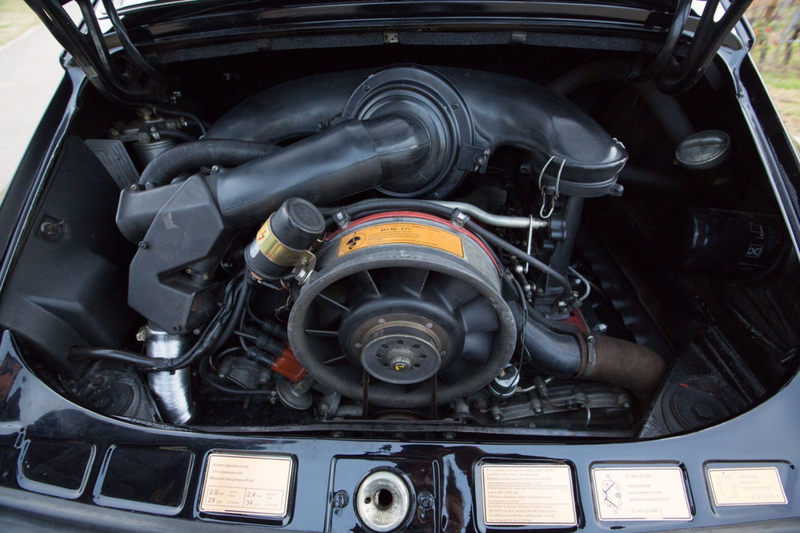 A 911 3.2L oil cooler was fitted to improve engine cooling under normal road conditions. A well known establishment, Joffroy Automobile in Arles, has just serviced the car and fitted a new DHKZ ignition system. We have a very comprehensive service history for the car from 2005 to date. The car has recently been resprayed in black (colour reference 700-9-2) and presents well. The door fits are excellent, sign that the body shell is sound and probably has never needed stripping. It seems the right time to remember that this car is one of the very last of this series in a production run of some 113 coupes and has the advantage of the hot dipped galvanized body. The interior is in excellent original condition with the original navy blue carpets and those tartan seats so typical of the period. Incidentally the car has two optional extras, which were rare at the time: an electrically operated driver's rear view mirror and a wiper fitted to the rear windscreen. Its excellent condition earned it an article in Flat Six in 2005. With 30,458 km on the clock and its detailed history of meticulous maintenance, we can offer this car in an ultra rare state of originality, which is not surprising when you take into account its history and the fact that it had that hot dip galvanizing at the factory.